Amalgam Marine specializes in custom-made scale yacht and maritime models for naval architects and engineers, yacht designers and specialist boat builders. We provide conceptual yacht and maritime model making services, highly detailed warships, and prototype models for use in the test tank. We have also seen the success that stripped-down, conceptual Speedform models can have on both the design process and marketing of yachts and seacraft. Our maritime model makers use computer-aided technologies to reproduce the lines and forms of the design, combined with traditional hand finishing skills and an attention to detail that assures quality and brings the model to life. See Our Work to view some of the models we’ve produced. 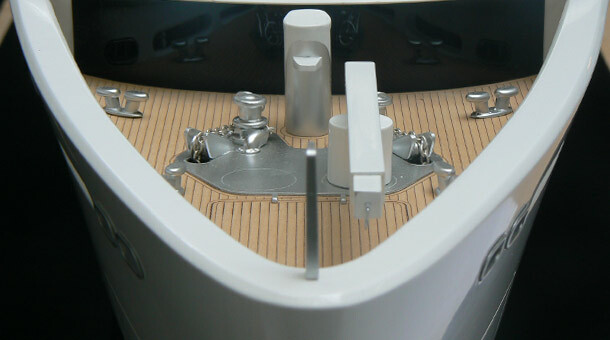 Our CNC facilities enable us to capture the clean flowing lines of luxury and Superyacht models. These models have ranged from sophisticated and elegant conceptual pieces for marketing suites and trade shows, to retrofits of existing hulls. Smaller designs and boat types lend themselves to high levels of detail and realism. Typically for private clients, these are models of smaller yachts and racers, and can be stunning display centrepieces for boardrooms and offices. We have also seen the success that stripped-down, conceptual Speedform models have on both the design process and marketing of yachts and seacraft. In the studio these sketch models represent the purest forms of the design and can be easily drawn on and reshaped; at trade shows and conferences they can be excellent marketing tools to compliment a larger, more finalised model.